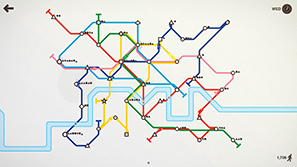 Mini Metro is a relaxing puzzle game in which you are tasked with building an efficient metro system for a city. Each game starts simply as you connect three stations with one line but as time goes by the number of commuters increase and it descends into a challenging and strategic experience managing the routes and avoiding fatal congestion. Releasing in early access, Mini Metro is missing some vital parts. 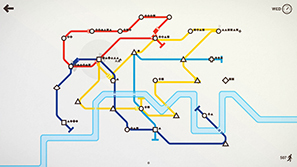 Each level of Mini Metro is presented in the form of a traditional underground map. There are currently only three levels available; London, Paris and New York. Each level is a representation of the real thing; you'll see the geography of the cities as a white silhouette with the river or bodies of water showing in blue. Each train line is the identical colour of the real world equivalent. This gives the game more authenticity, and makes it more enjoyable if you are already familiar with one of the systems, like I am with the London Underground. The levels begin simply. There are three stations and you have access to three lines, three locomotives and three tunnels/bridges. You can build a line by holding and dragging left mouse click from one station to another. As time moves on more stations will appear in randomised positions across the map which is constantly, yet very slowly, zooming out. Each station is represented by a different shape - circle, triangle, square - as are the passengers. They will take the route to the nearest station with the corresponding shape. 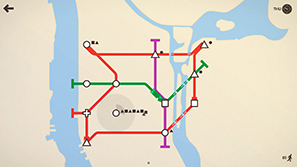 As time goes on the game introduces a greater variety of shapes that are used sparingly, meaning it's likely passengers will need to travel further to reach their destination. It is imperative to build an efficient system, combining different lines to ensure the majority of stations are as easy to reach as possible. In order to deal with the increasing demands of your metro system you are granted new items. There is a clock that goes through the week and every Monday you receive a new locomotive and the choice, from two, of either a new line, a carriage or two tunnels/bridges. If all of your available lines are in use you can add a second locomotive to one to ease congestion. You need the tunnels (bridges are used for New York, as in reality. From now on I'll refer to them all as tunnels) in order to build through rivers. You need to choose carefully. All of these are very useful, and necessary, and can determine success or failure. Once a station is holding seven or more people a timer begins. If the timer reaches its conclusion it is game over. So far my best run was 2440 people on the London Underground over 10 weeks. 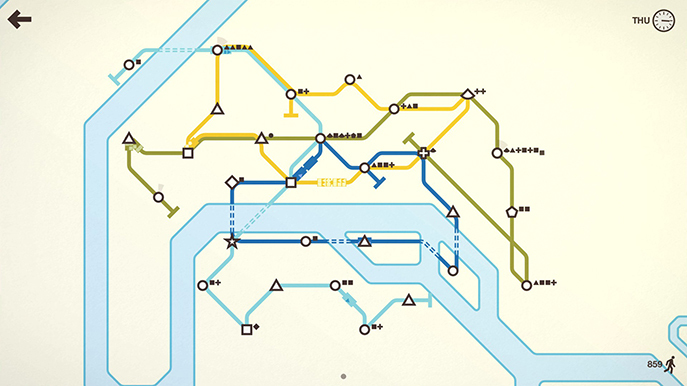 I've found Mini Metro a lot of fun to play. Its simple gameplay combined with the tricky management parts prove an addictive and enjoyable experience. Each game takes about twenty minutes to play through (reaching 2000 passengers) so it's a very easy to pick up and play. The visuals are near identical to real life tube maps and it's really fun to watch all the trains zip around your design. There are some big drawbacks to Mini Metro in this current state. This early access version is limited in its components. The biggest issue here is there is no audio whatsoever. This impacts the game considerably. When I first loaded it up I had my headphones plugged in and was immediately disappointed at the lack of atmosphere. I've since remedied this by playing my own music while in game but it loses some of its identity. Disasterpiece is working on the soundtrack so I'm in no doubt that when it is implemented it will be excellent. Only three levels are available at the moment and some settings are missing in game. I've had no bugs on PC version though on Mac it wouldn't load in fullscreen. 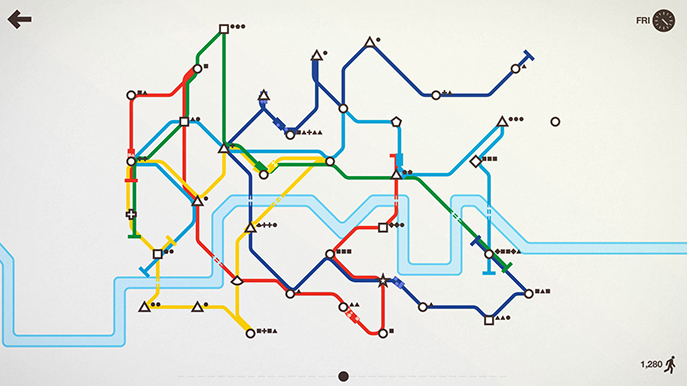 If you were already anticipating the early access release of Mini Metro I'd still recommend it. What is there is fun to play, very engrossing and will keep you coming back time and time again. If you were simply curious about it, it's worth waiting till some more components are implemented, especially the audio. What is there is great but the missing audio is a big hit. There is enough here for people that were looking forward to the game but if you were simply curious it's worth waiting for the release to be a little more complete.